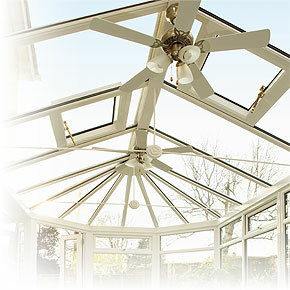 Conservatory roof glass enables conservatories to be used throughout the year. Glass is more expensive than polycarbonate, but it makes conservatories a more comfortable environment whether it's hot or cold. Conservatory glass is quieter in the rain and it cuts more traffic noise. Glass lasts longer than polycarbonate, and with self-cleaning glass the conservatory will look better for longer! Different coatings and tints in the conservatory glass can cut the harmful effects of the sun's UV rays on your furniture and fabrics. The conservatory roof glass we install is a new generation of intelligent glass manufactured to high specifications. The glass units are made from top performing glass and are filled with argon gas or air (depending on grade). 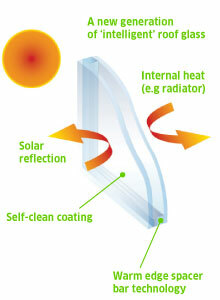 A warm edge spacer bar is fitted as standard and you have the option of true self-cleaning glass. By using these sealed units in a conservatory, external noise can be reduced by 29 decibels. Reduces strong light and glare from the roof glass by an average of 42%-60% to create a comfortable living environment inside the conservatory. Reduces heat build-up from the sun by an average of 44%-70%.